The World of Warcraft: Battle for Azeroth beta phase has begun. Fresh on the heels of patch 7.3.5 hitting live servers, there is now an alpha test client for patch 8.0, which will introduce Battle for Azeroth. It’s not yet playable – you can download it but you can’t log in – but that doesn’t deter dataminers keen to discover everything there is about the new expansion. For more on Battle for Azeroth, check our dedicated post. Most likely relevant for you is what this means for when the alpha/beta will go live to be playable by everyone who can beg, borrow, style, win, or otherwise acquire a key. It could be as early as later today, once Blizzard get back in the office and can start granting access to influencers and the like, but most likely some time in the next week or so. 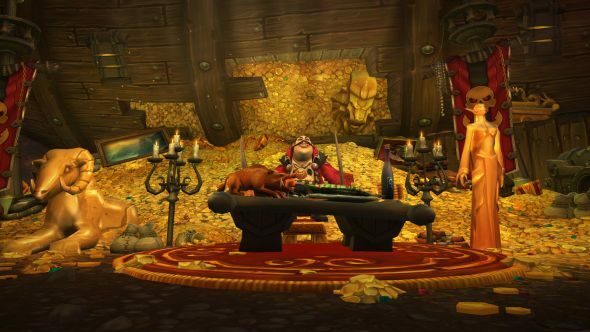 As for new content, Wowhead and MMO-Champion are hard at work pulling everything they can out of the client and translating it for the wider public. The vast, vast majority is clearly unfinished, with placeholder names and nonsensical number changes all over the place, but we’re not going to pretend that means you’re disinterested. Here’s a collection of new models, including adorable baby dinosaurs and eventual raid boss Queen Azshara, plus whatever the hell this is. Wowhead also have a list of all the spell changes currently in-game, as well as very quick summaries of whats changed for each class. These changes are not only non-final, but likely barely started, so keep your pitchforks away from the class designers for now. Perhaps the biggest news so far is that profession ranks are being squished along with damage numbers. They now max out at 100 skill rather than 800 in Legion, and a number of new items have also been datamined which let you improve your crafting in other ways. There will be lots, lots, lots more to come over the next 24 hours, and then again once people can actually log in and play new zones. This was the start of a nine month process last time – strap yourself in and listen to a little music.